Florida Lottery running The Flamingos’ commercial for 9 more weeks! PRESS RELEASE: Florida Lottery is signing on for another 9 weeks run of The Flamingos’ commercial. 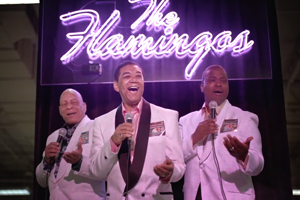 THE FLORIDA LOTTERY LOVING THE SUCCESS OF THE FLAMINGO FORTUNE COMMERCIAL! TALLAHASSEE – For the first time in the twenty-five year history of the Florida Lottery, weekly sales of Scratch-Off tickets exceeded $74 million. The newest record breaks the previous sales mark by $5.7 million. The Florida Lottery is believed to be only the third lottery-selling state to have weekly Scratch-Off sales top the $70 million mark. The other two are New York and Massachusetts. Last month’s sales were led by the Lottery’s newest $20 Scratch-Off game, $3,000,000 FLAMINGO FORTUNE, which launched on Tuesday, March 5. The $25 MILLIONAIRE Scratch-Off game followed closely behind with more than $8.5 million in sales. Also contributing to this record was “Florida Lottery Day at The Villages”, showcasing the new $3,000,000 FLAMINGO FORTUNE and Terry Johnson and The Flamingos’ crowd pleasing show. More than $70,000 was generated in ticket sales due to the thousands of players who participated in this event.